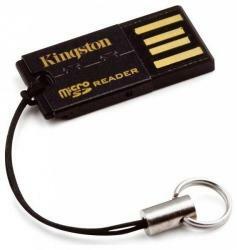 Маркирани оферти за Kingston FCR-MRG2 Как са подбрани? The reader has an included keychain, so you can hang it from your phone for the convenient solution you need to complement your mobile lifestyle. Store your entire mobile life — photos, songs, text messages, video clips, personal information — on a microSD/microSDHC/microSDXC card, then work with it across device platforms seamlessly with the microSD Card Reader.